REDWOOD CITY, CALIF.- The City of Redwood City’s City Council this week approved a resolution to create a pilot program to allow the use of autonomous robots, also known as Personal Delivery Devices (PDD), for a period of nine months in the City of Redwood City. The service will launch with 20 robots in December 2016. The City will permit Starship Technologies, Inc. to use their robots on City sidewalks and streets, delivering goods such as restaurant meals and groceries to residents and businesses. 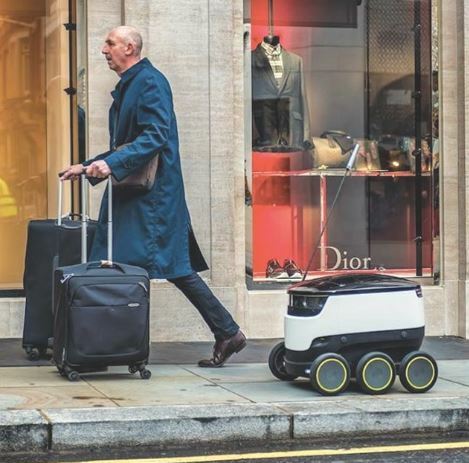 The London-based company, founded in 2014, created and launched the use of an autonomous delivery robot that is being used in many cities in the United Kingdom and Germany. Starship Technologies chose Redwood City as its primary pilot program here in the United States. The company is launching a smaller pilot program in Washington D.C. In a presentation to the Council, Starship Technologies representatives said they approached Redwood City as one of the launch locations due to the area’s acceptance of new technologies, its bustling downtown, and the high rate of use of delivery services such as Munchery and Door Dash. Starship Technologies will use the PDDs in Redwood City for an initial pilot period of nine months, and then decide whether to continue based on the results on the pilot. The PDD can carry approximately three grocery bags worth of goods and weighs about 50 pounds when fully loaded. It uses nine on-board cameras to assist in its travels along the sidewalks and going no more than four miles per hour. At street crossings, it is assisted by a human controller to ensure it is safe for the robot to cross the street and not impede traffic. The PDDs travel throughout a five-mile radius from their docking point. Customers can establish their delivery times, track their items while in transit on the mobile application at all times, and securely retrieve their items with their unique code that opens the robot. Starship Technologies plans to have two docking locations in the city and will also serve residential areas. For more information read the City staff report here. The City of Redwood City is a San Francisco Bay Area community located in the heart of Silicon Valley, the technology-rich region extending from the San Francisco Peninsula to the foothills of the Santa Cruz Mountains. Redwood City is the third largest city within the County of San Mateo, with 82,881 residents. The city enjoys an average of 255 sunny days a year, which it boasts via the city slogan: “Climate Best by Government Test”. Incorporated in 1867, Redwood City will mark its Sesquicentennial Year with celebrations beginning in May 2017.Redwood City is home to the San Mateo County History Museum (located in the county’s old courthouse) and the only active deep water port within the south bay of San Francisco. The city’s vibrant downtown, quickly becoming known as the entertainment hub of the San Francisco Peninsula, offers residents, visitors, and businesses a unique retail, entertainment, and restaurant experience. For more information, visit the City of Redwood City’s website at www.redwoodcity.org, or follow @RedwoodCity on Twitter and http://facebook.com/CityofRedwoodCity.